UNEXPECTED surprise weddings are one thing – but what about tying the knot on the other side of the world in the middle of a Shetland winter? That was the case a couple of weeks ago for an Australian couple who turned a normal family holiday into a trip they would never forget after deciding on their visit to the UK to get married in Lerwick. Brigid Krause and Shane Eaton, who are 26, spent their wedding night with a handful of the former’s family watching the Scalloway Fire Festival procession in the company of “Vikings and Pikachus” after tying the knot earlier that day (Friday 11 January) at Lerwick Town Hall. 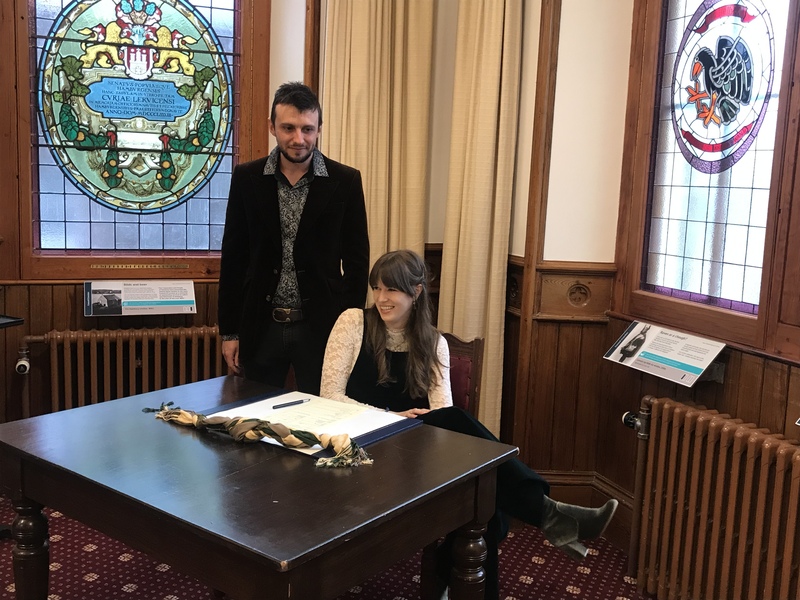 Sealing the deal inside Lerwick Town Hall. Brigid said their wedding was “halfway between spur of the moment and pre-planned” as the couple decided just days before to marry in Shetland, with their friends and other family thousands of miles back home in Australia. The original plan was for some of Brigid’s family – a party of seven people – to travel the UK and Ireland to celebrate her mum turning 60. “Trip underway, Christmas and New Years – very exciting and celebratory time of the year, and Shane and I thought…why don’t we get married? “Avoid all the lengthy stress of planning a wedding – can’t say I ever had the inclination to wear the pretty white dress either…and we’d probably do it one day, why not today? An email was soon dispatched to the Lerwick registry office and the plans were set in motion. Brigid’s family, however, only learned of the wedding plans the night before the big day. “We only told my mum the night before, when we got home from the pub that she may want to get a bit spruced up in the morning because she had a wedding to go to at 11am. It took a while to sink in before she realised we were talking about ourselves,” Brigid said. 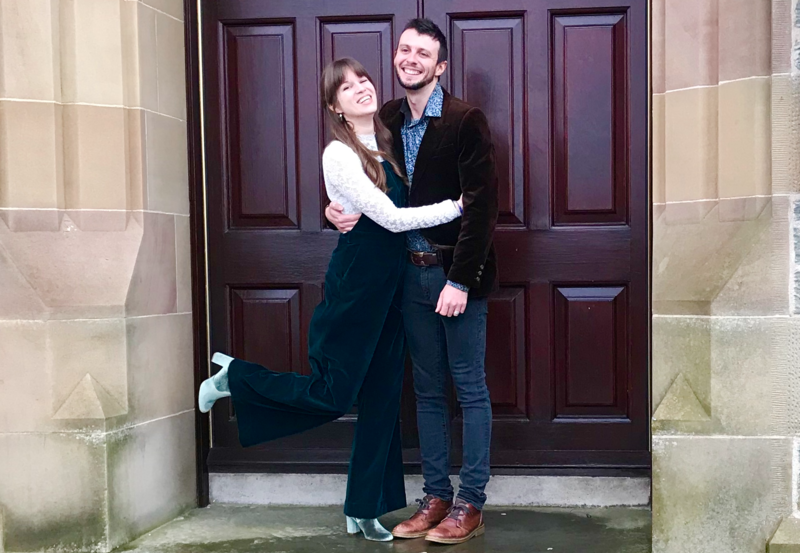 “I think her shock is what made us even more nervous about how everyone at home was going to react to such an unplanned and unconventional wedding…on Shetland of all places. The couple, who live in the Blue Mountains region of New South Wales, took part in a old Viking handfasting ceremony at the “beautiful” Lerwick Town Hall during the wedding before the group of seven went off for lunch – catching a glimpse of a seal in Lerwick Harbour too. 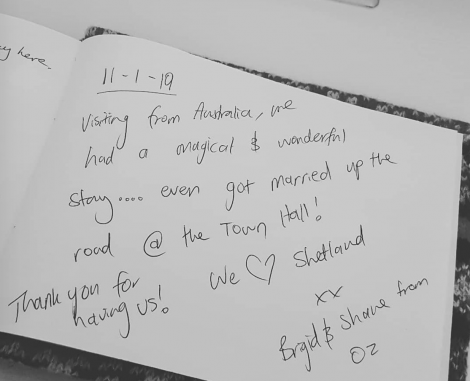 The wedding was a surprise too for the team behind Fort Charlotte Self Catering, who found this note in their guestbook after the happy couple’s stay. After getting “rugged up in about four layers of thermals”, they later headed off to take in the Scalloway Fire Festival procession – not exactly the most common way to spend your first night as a married couple. “We found ourselves in one of the pubs which was full of locals in costumes, from Viking to Pikachu,” Brigid recalled. 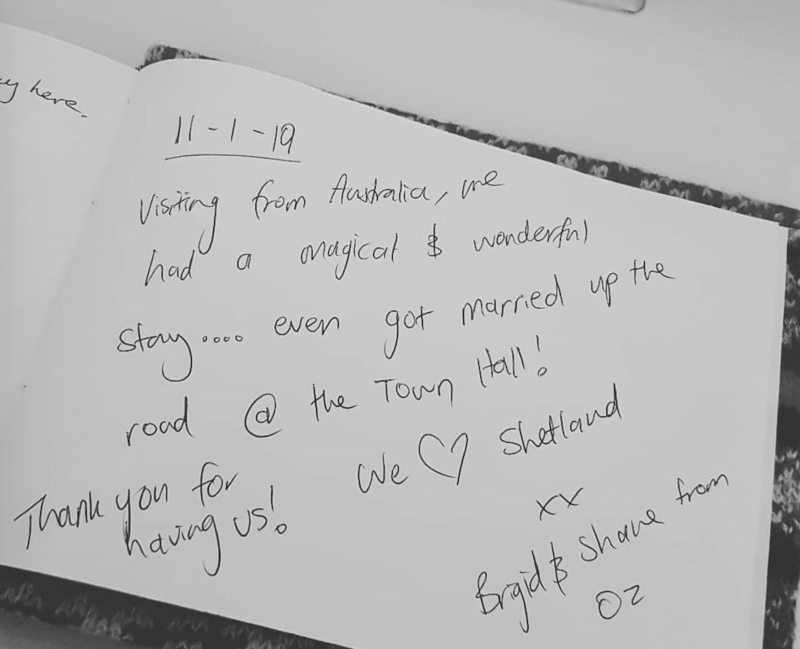 It seems Shetland ended up being the right pick for the couple, with the islands appearing to leave an indelible mark on the Aussie pair. “Pretty much from the second we touched down in Sumburgh we felt we were somewhere special,” Brigid said. “The landscape had completely changed from the rest of Scotland, the cold winds unlike winds we had ever felt, we could smell the sea and there were Shetland ponies everywhere we looked on our drive up to Lerwick.